The issue of treadmill safety was recently brought to the public’s attention with the passing of Dave Goldberg, Survey Monkey Chief Executive and husband of Facebook leader Sheryl Sandberg. The tragic death of Mr. Goldberg occurred while he was exercising on a treadmill at a private Mexican villa on May 1, 2015. According to a USA Today report, “Goldberg appeared to have lost his grip on the equipment’s railings, fallen backward and hit his head. The resulting wound was an inch long, and Goldberg lost consciousness.” Another article from the New York Times stated that, “he fell off the treadmill and cracked his head open.” He eventually died at a nearby hospital. This is an extremely sad event that highlights a worst-case scenario. The US Consumer Product Safety Commission reports that there were thirty treadmill-related deaths during the ten-year period from 2003-2012, with an average of three deaths per year. While deaths are relatively rare, injuries like twisted ankles and bruised noggins are much more common with 24,400 yearly injuries. These are injuries that require a trip to the Emergency Room. This is compared to a total of 62,700 injuries from general fitness equipment. 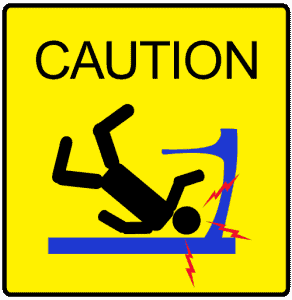 Injuries due to missteps on a treadmill are not unlikely if you fail to take the proper precautions. How many of us have experienced a treadmill misadventure? Perhaps you were adjusting the music on your iPod when you strayed too far to the side of the belt? Or, perhaps you hit the wrong button and your machine accelerated rapidly before you were prepared? Most of the time, we take your misstep, go crashing to the ground, and then do our best to sooth our bruised ego and bruised backside! If you need further proof that injuries on treadmills are occurring, check out this cringe-worthy video compilation of treadmill tumbles. Most of these clips show people misusing the machines and reaping the painful results. We are confident that our readers here would exercise much more common sense! To ensure that you are avoiding treadmill injuries in your next workout, we would like to present ten tips to keep you safe and injury free during your next treadmill workout. We spoke with representatives from Johnson Fitness, maker of Horizon Fitness and Vision Treadmills, to get their advice. You will also hear from industry expert Fred Waters on his top tips to maximize your safety. 1. Make sure you have room for an emergency dismount. If you take a misstep on your machine, the moving belt is going to carry you one direction…backwards! The representative from Johnson Fitness, maker of Horizon treadmills, shared, “Ensure you have 2 meters (6 feet, 7 inches) of clear space behind the treadmill for emergency dismounting.” This way, if you do stumble or need to jump off, you will at least have a clear place to land. 2. Wear the right shoes. Often, simply using the proper footwear can prevent missteps and leg injuries. Fred Waters suggests that you wear comfortable shoes with enough support to provide shock absorption and enough tread to provide a good grip on the belt. 3. Plan an appropriate workout. Fred’s next piece of advice is especially important for those who haven’t been working out regularly or have pre-existing medical conditions. “Ease into an exercise routine if you have been out of shape,” he shared. “Start slow. Besides the potential for heart issues, you could do serious damages to the lower body joins if you overdo it the first time.” It is always a good idea to check with a doctor before beginning a new exercise program. 4. Choose an appropriate machine. Not all machines are suited for all types of people. If you are a tall person planning to run high-speed intervals, you certainly don’t want to choose a machine with a short deck, narrow belt, and a motor only suited towards light jogging. In fact, Fred recommends you avoid machines with small walking surfaces all together. With decks as small as 16” in width and 48” in length, it is more likely that you will take a misstep off the side of the belt and lose your footing. Be sure to check our site to find more Horizon treadmill reviews so you can find the perfect machine to match your fitness goals. 5. Wear your safety clip! The top piece of advice from Johnson Fitness was to wear your safety clip. You may feel a bit silly, but in reality, this is the best way to make sure you don’t injure yourself. If you take a misstep and fall away from the machine console, the clip will disconnect and automatically stop the motion of the belt. 6. Don’t stand on the belt to start your machine. Johnson Fitness also recommends that you stand on the side rails to start your machine and gradually work up to faster speeds. 7. Choose a speed and elevation that you can safely handle. If you took the time to watch the video above, you’ll see that most of the injuries occurred because people were dealing with outrageous speeds and inclines beyond their ability to handle. If you’re choosing one of the preset workout programs, make sure you have an idea of the speed and inclines involved so you are not caught by surprise midway through your workout. This advice can be extended to caution you against using your smart device or being distracted by passers-by while working out. Just look at what happened to this poor guy when he noticed an attractive lady in his gym! 10. Prevent childhood injury. The last tip goes out to those parents out there who are working out during their child’s nap time. Be sure to turn off, unplug, and remove the disconnect clip from your machine so that your children can’t injure themselves during curious play. We hope you enjoyed our top ten tips for maximum treadmill safety. Use these tips the next time you go for a workout on your favorite treadmill. If you are not sure which machine is best for your fitness goals, be sure to check out more articles, brand descriptions, and treadmill reviews on our site. We can tell you about the best models available from brands like NordicTrack, ProForm, Sole, and Bowflex! Do you have any tips for treadmill safety? Please share your thoughts and stories below!